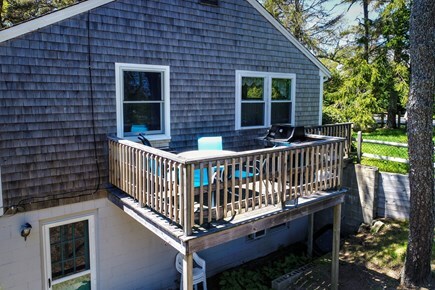 Look no further for your ultimate Cape Cod retreat - this adorable duplex for six is conveniently located just a few blocks from the beach in the small town of Orleans. You'll have plenty of space inside full of cozy furnishings, plus great outdoor space with a nice patio, grill, and outdoor shower. 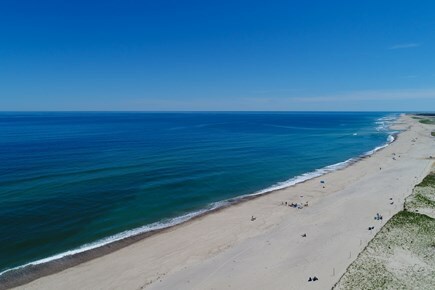 Breathe in the salty sea air and stroll over to Nauset Beach, which is just a few blocks away from the home. Located in East Orleans, you'll find plenty of amenities just a few miles away in downtown Orleans along Old Colony Way. 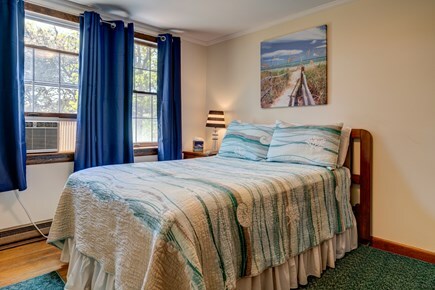 From art galleries to colonial museums, there's something for everyone in this quaint Cape Cod town. 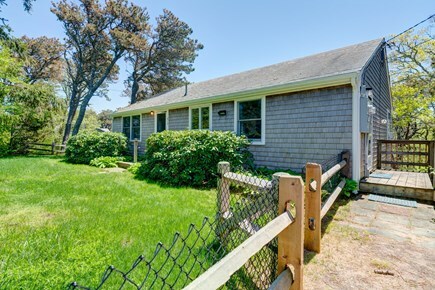 Classic shingle siding and lush greenery greet you on the exterior of this home. 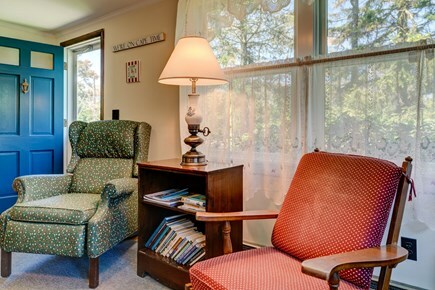 You'll enter into the inviting living room, which boasts an array of comfortable furniture for relaxing and lounging. 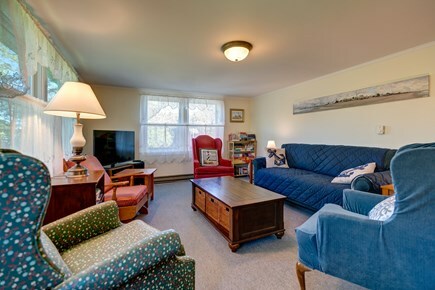 After a day on the beach, head indoors, sit back, and watch a fun TV show on the cable TV. If you need to send that last email or check the latest weather report, the complimentary WiFi is available, too. 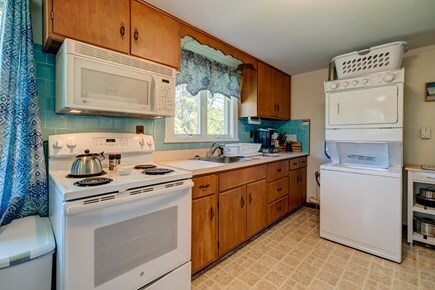 In the quaint kitchen, you'll find all the essentials for prepping snacks for the beach or family meals. 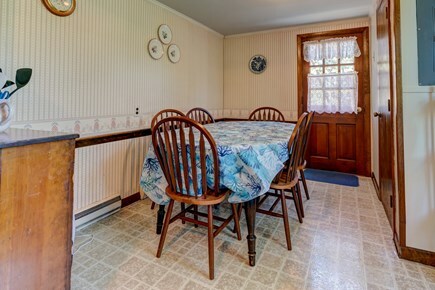 The eat-in kitchen is open to the dining table, which can seat up to six guests for a memorable family meal. 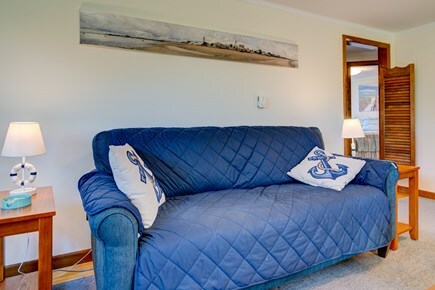 You'll also have your own private washer/dryer in the home, so keeping up with sandy clothes from the beach is a breeze. 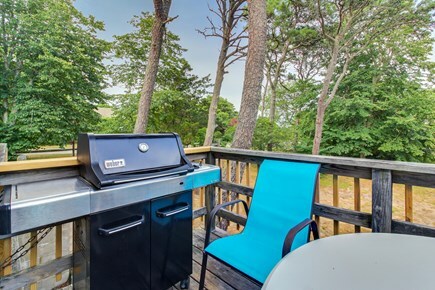 On the side of the home, you'll have access to the deck, where you can grill up your summertime favorites on the gas BBQ. Enjoy an al fresco meal among the beach greenery surrounding the home, thanks to the outdoor table with seating for five. There's another table on the lower level patio - complete with an umbrella so you can relax in the shade. You'll also find the outdoor shower near the patio in the back yard, where you can rinse off all that sand and saltwater before going inside! 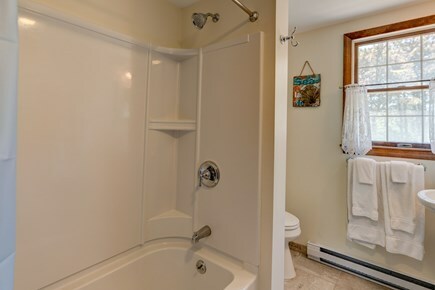 With three bedrooms and one full bathroom, this home will accommodate up to six guests. The first bedroom features a queen-size bed, plenty of storage for your wardrobe, and a comfy chair for cozying up with a good book. 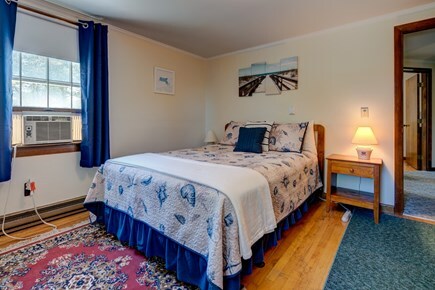 The second bedroom has another queen-size bed and a window A/C unit to keep you cool in the summer months. 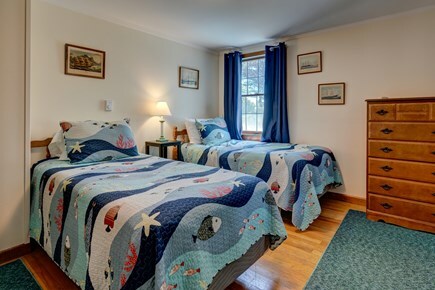 In the third bedroom, two twin-size beds make this the perfect spot for kids or younger guests, plus there's another window A/C unit in this room. 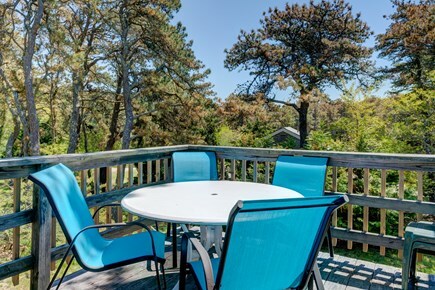 When you're ready to go exploring, Nauset Beach is only about two blocks away. Simply gaze out at the water visible from the front parking area of the home and follow the road. From swimming and sunbathing to water sports and sailing, this quintessential summer town is all about enjoying the ocean. Take a walk down Beach Road, which turns into Main Street, and experience all that the town of Orleans has to offer. You'll pass by beautiful tree-lined streets full of cute homes, and have plenty of restaurants and amenities to choose from. Explore the natural scenery at the nearby Kent's Point Conservation Area, where you can walk the trails through greenery and scenic marshes. For water sports fans, kayaking and canoeing out in the ocean and along the many inlets near Orleans is always a popular choice. There's also fishing charters where you can experience the thrill of the catch, or boat tours where you can see the coastline and local wildlife. Additional pricing info: For real-time pricing information, including the cleaning & booking fees, please contact Vacasa. State and local taxes of 12.45% will apply.